So I have been on the road for nearly two weeks on a western road trip, the highlight of which was hiking to the bottom of the Grand Canyon and back up top in 9 hours. Despite being in good physical condition, I found the hike extremely difficult, probably the most difficult physical task I ever completed. Despite the physical hardship I endured, the hike was an unforgettable experience with 360 degrees of fantastic views. It’s something I’ll never forget. 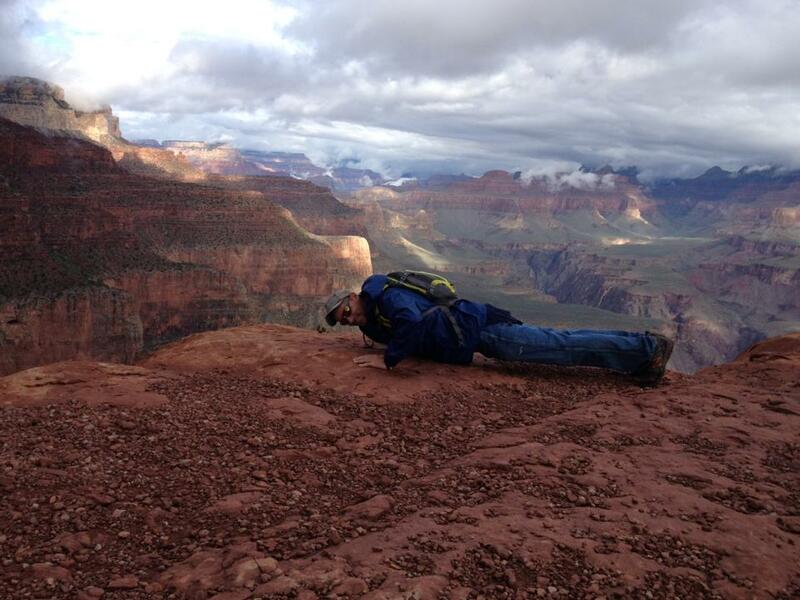 Unfortunately, the Grand Canyon hike was pretty much the only substantial exercise I got during the trip. There were a ton of days where I was spending 12 hours plus in my conversion van going from one destination to the next. When I got home I stepped on the scale and saw I gained 3 pounds which put me on high alert mode since I was already 5 or so pounds heavier than I want to be. It’s time to cut out the fun and games. For a period of almost two years my weight was hanging in the low 170’s, even dipping into the upper 160’s from time to time. Looking back, I did not look well at that weight. My thinking at the time was if I wanted to be able to do better with bar work I needed to weigh less, giving me less weight to pull/push. Although I still believe that the less you weigh the better you will do in calisthenics, I realized that no matter what I weighed I wasn’t going to be able to complete the BBR’s. My physical build and advanced age rob me of the endurance I would need to complete it. Slowly over the last year or so the numbers on the scale have been creeping upward, first 175, then 180. When I got back from the trip I weighed 185 before taking my shower. Now at 6’3″ plus, 185 pounds is a totally healthy weight, but for my fitness goals I would be much happier around 175 pounds. Not only does being lighter assist my strength to weight ratio it also helps me with the endurance training I do like running. Lighter weight means less pounding on my fragile knees. So there is no more messing around, it’s time to get serious. Part of getting serious is reintroducing timed circuit training into my workouts. One of the best such workouts I have done is Ray’s Way which is 5 sets of dips, pull ups and push ups with defined work and rest periods. These type of workouts force you to work out of your comfort zone as the clock tells you when to start and stop, whether you are ready or not. I figured what better way to kick start myself than to try a Rays Way yesterday. I had to do the attempt indoors since it was pouring rain outside. It is more difficult trying to rep indoors since doorway mounted exercise equipment is not meant to be repped on hard and fast. I set my goal reps to what I thought were conservative numbers, 15 dips, 8 pull ups and 22 push ups per round. In the very first round I could tell I was in trouble. I cut my push up reps to an even 20 to try to save energy. I couldn’t believe how dead I felt after one round. Round two was harder and then in round 3 I failed to complete the 20 push ups before the 3 minute work set expired, two full sets short of my goal. I was very disappointed in myself but will use that failure as motivation to keep doing the timed workouts on a consistent basis. The lethargy continued today with my first gym workout in nearly two weeks. My endurance/strength just isn’t there. In a way I feel similar to when I come back to working out after being sick for a period of time. It’s frustrating, here are the stats.